Since KC Piper’s 31-24 overtime loss to Bonner Springs in week five, the Pirates have outscored their opponents 252-46 in five games. Four of those games they have scored 50-plus points. The Pirates travel to Paola to take on a Panther squad that squeaked by Ottawa, 27-21, for a second time this season. Piper is led by their stout defense. In their nine wins this season, the Pirates have held their opponents to 18 points or fewer, including three shutouts and six games where they allowed eight or fewer points. On the offensive side of the ball, Piper favors the ground game. Junior running back Sterling Owens lead the rushing attack with 947 yards and nine trips to the end zone, while Travon Jones has rushed for 631 yards and eight touchdowns. Senior Colton Beebe leads the team in scoring with ten trips to pay dirt. But don’t sleep on the Panthers. The deeper you get into the playoffs the longer the games become for the starters. Fortunately for Paola, close games have been their calling card. Last Friday marked their second, 6-point win over Ottawa this season and the Panthers’ seventh game decided by single digits. Paola could very well be 9-1 as well this year, if it wasn’t for two one-point losses in Week 1 and Week 9. Paola will give Piper all they want in this quarterfinal matchup, but I think the Pirates defense and ground game prevails. The Fort Scott Tigers will not only host a Bishop Miege team that is ranked No. 1 in Class 4A Division I, but a Stags team that some argue could be the best in the state regardless of classification. Bishop Miege rolled through an Eastern Kansas League regular-season schedule that is full of Class 5A and 6A teams. The Stags have defeated three 6A schools this season, beating Blue Valley Northwest, Gardner-Edgerton and Blue Valley. The 42-21 win over a ranked Blue Valley team in Week 3 opened eyes across the state. It remains Blue Valley’s only loss of the season as the Tigers are set to play in the 6A quarterfinals on Friday night. The Stags also own a win over 5A quarterfinalist St. Thomas Aquinas. Bishop Miege is led by senior quarterback Ryan Willis, who verbally committed to play for the Kansas Jayhawks. Willis has passed for 2,236 yards and 28 touchdowns. Junior Dawson Downing has rushed for 1,539 yards and 21 scores. Sophomore Jafar Armstrong has 37 receptions for 770 yards and five touchdowns, while Danny Murphy has 28 catches for 500 yards and seven scores. Fifth-ranked Fort Scott’s only loss came 41-0 to Pittsburg, which will compete in the Class 5A quarterfinals on Friday. The Tigers have boasted a strong defense, allowing 13 points or fewer in seven of 10 games, but gave up 330 yards on the ground against Baldwin. Quarterback Mason Knopp passed for 195 yards and two touchdowns during last week’s 24-12 playoff win over Baldwin. Knopp has passed for more than 800 yards and eight scores this season. Alex Fink caught seven passes for 152 yards and a touchdown in the win over Baldwin. The senior has 28 receptions for nearly 500 yards and five scores. Fort Scott averages more than 200 yards rushing per game led by Chase Brown’s 618 yards and eight scores. The Tigers will need another balanced effort on offense, play ball-control, and avoid turnovers to try and stay with the Stags. Buhler hosts Andover Central in another class 4A-I quarterfinal matchup. Andover Central will try and win back-to-back road games to start their playoff run, while Buhler looks to stay hot and put points up on the board on Friday. Throughout their ten games this season, Buhler has scored 48 or more points on six different occasions. Averaging just over 44 points per game, Steve Warner’s team has been difficult to contain. Led by quarterback Jace Williams and running back Dillon Engelland, Buhler must make it a track meet on Friday to advance to the semifinals. Andover Central outscored Augusta 38-33 to advance its quarterfinal matchup with Buhler. The Jaguars will ride the legs of junior running back Jordan Birch. Birch carried the load in its win over Augusta with 138 rushing yards and three touchdowns. In order for the Jaguars to pull an upset and their second road victory of the playoffs they must control the time of possession. If Birch can move the chains, Andover Central can keep the Buhler’s high-powered offense off the field. I always tend to favor scoring over time of possession. I’ll take the defending 4A champs to advance to the semifinals. Perhaps the surprise of the first round, Mulvane scored with under 30 seconds remaining to top McPherson 28-25. The Wildcats’ reward is a date with powerful Topeka Hayden in the 4A, Division I quarterfinals. The same Hayden Wildcats that eliminated Mulvane in this very round in both the 2010 and 2011 seasons. Mulvane built a 21-11 lead on McPherson, which was playing without star quarterback Kyler Kinnamon for a second straight game. Regardless, the Bullpups led 25-21 late when Mulvane quarterback R. J. Rieger hit Jace Price on a 5-yard touchdown pass with 29 seconds remaining for the lead. Rieger passed for more than 220 yards in the game and has been the Wildcat’s leader all season. He has thrown for nearly 1,900 yards and added more than 550 yards rushing. Mulvane enters this game with a 4-6 record, but four of those six loses were to playoff qualifiers. Topeka Hayden enters this match-up as the favorite having survived the tough Centennial League schedule. The Wildcats’ lone loss came 23-20 on a last second field goal to Manhattan back in Week 3. 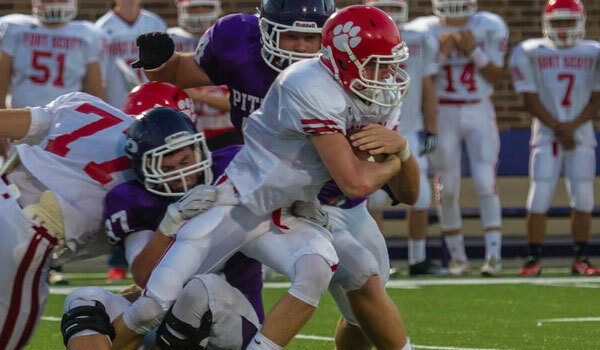 The Wildcats have posted wins over 5A playoff qualifiers in Topeka Seaman and Shawnee Heights, as well as Andover Central which is still alive in the other 4A-1 quarterfinal. Senior quarterback Jacob Head has passed for 1,521 yards on the season. Head was ultra-efficient in the first round win going 13 of 15 for 240 yards and three touchdowns. Connor Schumacher carried ten times for 108 yards and a touchdown against Coffeyville. He also caught a touchdown pass from Head. Daniel Gaito has rushed for 523 yards and is averaging more than five yards per carry. The Wildcat defense forced four turnovers in the first-round win, but also gave up 215 yards on the ground to Coffeyville’s LaDarrius Johnson. Now their focus will turn to containing Rieger.